An interview with Faranguis Habibi, the former Director of the Persian desk at Radio France Internationale about the recent revolutions in North Africa, the current state of the "Green" revolution in her native Iran and the political future of the Middle East. "A slow response or a lack of clarity could easily awaken other demons", she warns. Was the spark that led to these revolutions primarily economic in nature? Did the global recession push these societies to a point of unbearable frustration or has the tension been building over years and decades? The popular uprisings in North Africa and the Middle East are the result of economic, political and demographic factors, which, though at times are very similar, are actually quite unique from country to country. Poverty and economic uncertainty are the common features of these societies. Youth unemployment (31% in Tunisia and 17% in Egypt) offers a bleak prospect for the young who for the most part live in the major cities. The redistribution of wealth is simply not taking place and the ever-increasing gap between rich and poor seems to be an immutable fact of life. To this must be added the corruption of the ruling families and their maintenance of political power through censorship and repression. This antagonism is evolving in a context of economic and media globalisation, which is a major factor behind the demonstrations. The recent protests were calls for political and cultural homogenization and for economic justice that corresponds to the new reality of globalisation. It has been a cliché that Islamic countries are not suited to the democratic system. Is there any truth in this statement? Although Muslim countries are not a homogeneous group and are subject to different political systems (Indonesia, Iran, Turkey and Saudi Arabia have considerable differences in their political systems), they are all developing countries where democracy is not perceived as it is in the West., which has institutionalised democracies and where its citizens have internalized this reality for at least 150 years. In Saudi Arabia, democracy is blasphemy, while in Turkey the elections are recognized as the main lever of political power. As for Iran, for thirty-two years it has been entangled in a hybrid islamist-parliamentary system from which the people are trying to break free. Theoretically, there may be incompatibility between Islam and democracy, but what is really slowing down the rise of democracy in some Muslim countries is the strumentalization of Islam as an institution, the local political power structures and the clan system, as in Iran and Saudi Arabia. Who are the new points of reference in the region? Are Saudi Arabia and Iran the new regional super powers which will be fighting for dominance? Given its immense financial power, Saudi Arabia has always had a special place in the Arab world. On the diplomatic front, given its trusting friendship with the United States, the country has at times played the role of mediator. Regarding Iran, the Arab masses, disillusioned with their leaders, found in Iranian president Mr. Ahmadinejad an anti-American and anti-Israeli “knight”, whose virulent speeches helped them let off steam. Today, with the winds of freedom blowing through Arab societies, under the admiring gaze of the world, the Arab masses have found their own reference points. They do not need Ahmadinejad or their own heads of state to recover their national pride. Their democratic momentum and what they have gained from standing up for their rights is enough for them. However, at the state level, I think Turkey is certainly the most successful example of a prosperous Muslim state which is active on the international stage. What sort of a political system will emerge? What do the demonstrators want exactly? There is a generalised worry, particularly among western powers that the Islamic parties will take advantage of the situation and impose a new form of dictatorship. How do you see things developing? These societies, long kept under the yoke of repressive policies are on the march. They are experimenting and creating their own way forward. The slogans that have been launched so far indicate that people are demanding social justice and an economic and political system that allows for political alternation and the participation of citizens in the government of the country. What is remarkable is that none of these movements have raised the foreign policy issue. That is to say, the protesters demanded that their leaders be held accountable for their internal politics. “Imperialism”, “Zionism” and the “unbelievers” were not the targets of the revolt. No religious or ideological slogans have been heard. I think that the people and Islamic-leaning organizations have learned from the Islamic Revolution of Iran. The failure of political Islam has made everyone more vigilant. I think if the economic and political reforms are carried out through dialogue and with a respect for pluralism, Islam will not find fertile ground for development. It should be noted that Islamic extremists groups such as Al-Qaeda have been seriously disoriented by the growth of the democratic movements in Egypt and Tunisia. Is the Iranian revolution still active? Some have said that the Green Revolution did not go far enough as it merely supported liberal members of the regime and did not push for full liberty and democracy. Is this true? The green movement in Iran has been under considerable pressure during the past year. It no longer has any newspapers or magazines. All of the officials who were in some way contributing to the analysis of the situation and the organizing of action have been arrested. Many civil society activists have been imprisoned or forced to choose exile. Recently, its two main leaders were arrested. Despite this, for nearly a month, every Tuesday there have been limited but lively protests in the major cities of Iran. It is true that in these cases there is a huge police and Basij presence but that has not stopped young people from shouting in the streets, warning the Supreme Leader, Khamenei, that after Ben Ali and Mubarak, it would be his turn next. The policy of intimidation and the all-out effort to deter the protesters and make them stay at home has not had the desired effect. Not only that, the regime is damaged internally, so it cannot undertake a total and bloody repression like the one the opposition experienced in the 1980s when there were thousands of deaths. The presence of two former officials at the head of the Green Movement, has largely contributed to the internal divisions within the Islamic power base. This would not have happened if the movement directly called into question the rule of Islam and demanded a complete re-assessment of the Islamic Revolution . At the same time, Moussavi and Karroubi have evolved considerably over the last year-and-a-half, in line with the people’s more radical demands. They say that politics is the art of the possible. If there was a different balance of power in the political arena, it would be possible to move beyond the current demands. The separation of religion and politics has always been considered fundamental to a successful democracy. How will this issue be dealt with? Iran’s experience has shown, in fact, the adverse consequences of a theocratic regime for democracy and religion. I think the Islamic and pragmatic movements throughout the Muslim world have learned from the Iranian experience and want instead to be recognized as political forces that participate in the democratic process and not as an ideological bloc that monopolizes power. How are the Iranians reacting to the revolutions in North Africa? 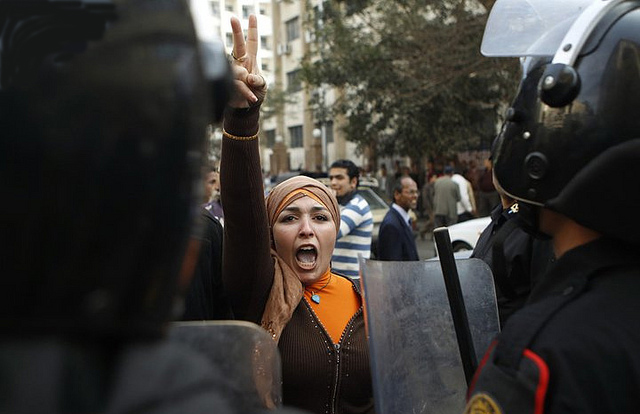 The uprisings of North Africa have greatly encouraged the Iranian protesters. In fact the resumption of street protests in Iran coincided with the revolutionary movements in Tunisia and Egypt. The position of the Iranian regime has been to support these movements verbally by calling them Islamic and anti-American. In fact, I think the rapid ousting of Ben Ali and Mubarak seriously frightened the Iranian government. The USA and European countries have found themselves as having financed and supported the wrong side. They were backing the dictators. How will this affect future relations? Western policy towards dictatorships has never followed moral or democratic considerations. During the Cold War, issues were defined in terms of the rivalry with the Soviets. Later, it was the specific national interests of the USA or the EU that guided the diplomatic choices (for example, France exported over 80 million euro’s worth of weapons to Tunisia, Egypt and Libya in 2009). I think these recent movements have also surprised the Western powers, who will now try to engage with the new regimes. The freedom movements do not seem to be hostile to the idea of normal and friendly relations with the West. The Iranian revolution seems to have stalled. What is going on? The rapidity of the recent uprisings in North Africa prompts comparison with the Green Movement in Iran which appears to be stagnating. The question deserves further analysis. At first glance, I think there are at least three factors that should not be overlooked in this comparison. First, the size and unity of the repressive forces in Iran are not the same as in these countries. Do not forget that there has been a bloody crackdown in Iran that has left its trace in the nation’s collective memory. Second, Iran is a country that has no accountability to any foreign power. This was not the case under the Shah. Egypt with the billion dollars of annual aid it received from the United States, could not rebel against them. Third: Iran is a rich country. Despite embargoes and sanctions, it can redistribute wealth among the different social strata. Hence the absence of a genuine workers’ strike capable of blocking the country’s main economic activities. This however, does not preclude widespread discontent in the population. Moussavi et Karroubi have been arrested. Is this a sign of confidence or nervousness? The arrests of Moussavi and Karroubi and their wives shows both the irritation, nervousness, and hatred of the hard-liners of the regime towards these ungrateful parents of the revolution. This has also demonstrated the inability of the authorities to exercise their power “head on” and without compromise. Embarrassment is the word that best describes the situation in which the regime finds itself, both in terms of its attempts to face up to its internal problems and the events in North Africa and the Middle East. Have Egypt and Tunisia gone past the point of no return? Is the process irreversible? I do not think there is just one single revolution going on. The situation is not exactly the same in Tunisia, Egypt and Libya. A huge upheaval has begun. Strong democratic movements are taking shape and the light of wisdom has emerged. But the gains have not yet been consolidated. One thing is certain, the traditional dictatorships will never return. The road towards a Western style democracy is long and lined with challenges. It depends on the intelligence and decisiveness of the new leaders. A slow response or a lack of clarity could easily awaken other demons.